At Audiense we treat our legal responsibilities with utmost importance. Since the announcement of the changes coming into place through the General Data Protection Regulation (GDPR) we have introduced a business-wide project, led by our privacy committee, Juan Sebastian Mesa (DPO and Head of Operations) and Javier Buron (CEO), to ensure Audiense is fully compliant. This has and will involve working with our partners, suppliers, and expert consultants to ensure our customers and suppliers can have absolute confidence in the service we provide. The GDPR (General Data Protection Regulation) is due to replace the 1995 EU DPD (Data Protection Directive) in effort to enhance the protection of personal information for EU citizens. When does the new regulation come into practice? What is the Data Protection Office (DPO)? What is Audiense doing about GDPR? 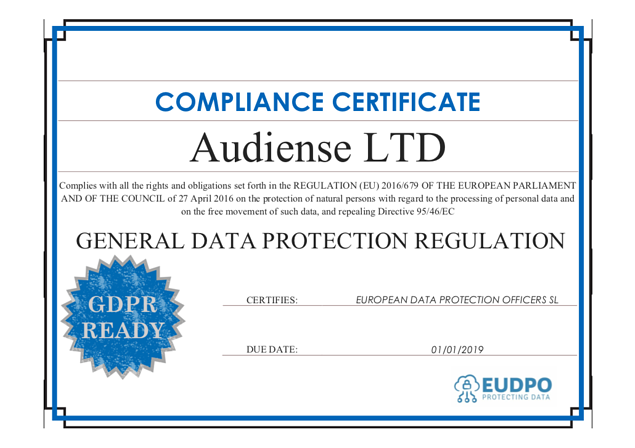 Audiense began to dedicate internal resources to the GDPR in June 2017, almost a full year before the deadline. We did this because we value our customers (and their customers) rights to privacy. Compliance with and to international law and regulations are very important to us. We won’t store any emails, we will just process them. This will make not having any emails when you download the matched excel export. We deployed all the changes the 24th of May and we communicated them with all of our users and customers. A sub-processor includes any third party that we share personally identifiable info with. Certain sub-processors only applies if you have used certain functionality. If you have any questions about how we use this sub-processors please send us an email to privacy@audiense.com. Our privacy committee is more than happy to answer any questions you may have. For that, please send an email to privacy@audiense.com.